Here is a wonderful method for cooking zucchini and I can almost guarantee you will make it over and again. This zucchini is such a silky melt in your mouth bit of goodness that I have been cooking it for my family every week for a good solid month. There’s nothing to it but olive oil, garlic, basil, and zucchini cooked long enough to take away any sense of crispness whatsoever. Yes, the life is cooked out of it and yet it is full of life and such comforting flavor. Simple, satisfying and delicious. You can start this, walk away, allow it to gently cook and return occasionally to turn with a spatula. Turn off the heat and let them sit for a while so the flavors settle and the oily juices thicken. Serve warm. Heat the olive oil in a large non-stick skillet and add the garlic for about five minutes, or until the garlic is fragrant and just beginning to turn golden. 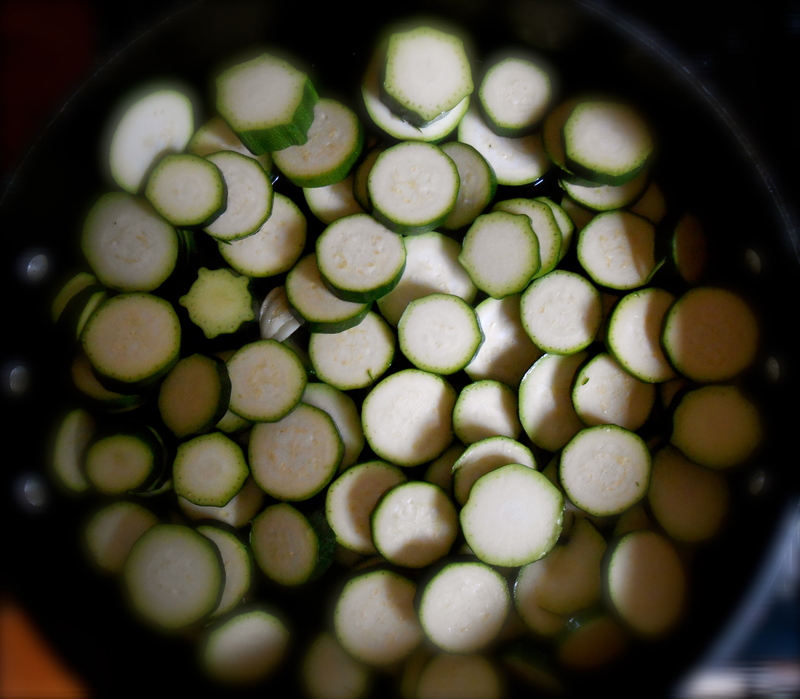 (Do not allow the garlic to brown) Add the zucchini and a generous pinch of salt, and stir to coat the rounds with oil. Cook gently over medium heat (or medium low), stirring occasionally until the zucchini is very soft, approximately 30 minutes. When the zucchini is soft and golden brown, remove it from the heat. Tear the basil leaves, and stir them into the zucchini, allowing them to wilt in the heat. Serve warm or at room temperature with a generous sprinkling of feta. Perfect! The only bad part about zucchini, in my opinion, is the crunch, so there’s no doubt I’ll try this! I have to agree with you Sarah. Zucchini does not have to be “al dente” in my opinion. Hope you get a chance to try it…it’s delicious. Love this, I like to cook my zucchini so it’s soft and nicely browned. Love this method. Yeah, there seems to be a fine line between soft and mushy when it comes to zucchini. Soft is perfect, and brown too. 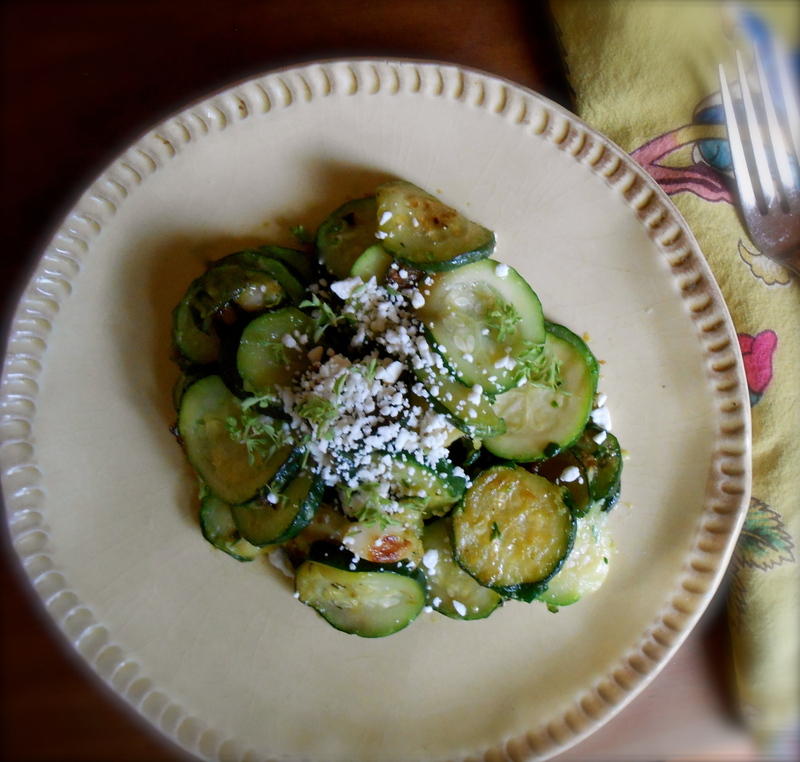 Zucchini is such a great side dish and I really like that you added basil and feta. Thank you. I think even dill and feta would be a winner. I’m trying to use up my greek basil before the cold takes it. Me too! :) Nice to hear from you! Yes indeed, steamed is great too! I tend to lean toward the cook until soft, no crispness though. Actually, I can eat it raw too now that I think about it. I love zucchini! I eat this same dish also & love it too! :) Yummm! Great! Glad you are enjoying it this way. Everyone needs to. Right?! We talked about doing this with green beans before, didn’t we? Delish. My standard zucchini prep is pureeing into a soup, so it’s good to have a new recipe in my box. Thanks! Yes we did. I actually posted a green bean recipe where I cooked the heck out of them. I love these vegetables so much! That looks very tasty and a good way to cook them. Thank you Conor. Can’t wait to cook up those oxtails! Another wonderful recipe. I love it cooked this way. It becomes so rich and buttery in flavour. Sometimes I coarsely grate my zucchini and cook it down this way until it disintegrates into a gorgeous pasta sauce. Oh wow! I’ll have to try that. I’m all about gorgeous pasta sauces and this sounds heavenly! Thank you. I’m sure we are food soul mates! Some diced tomato fresh or canned is also a nice compliment to the zucchini both visually and on the palate! Yummy! Yes I agree. I am hearing quite a bit about adding tomatoes to this and I think I’ll do it next time I make this. Thanks! Yum, seana! I haven’t cooked much with Zucchini this year, but the moment I see them I will have to grab some. Plus, this method sounds so easy, and relaxed, and delicious. thank u for sharing dear friend! Hi there! Nice to hear from you. I just visited your new blog and it’s beautiful Felicia! This looks and sounds delicious!!. I did something similar recently and added slow roasted cherry tomatoes. Zucchini can be tasteless mush in the wrong hands, but not yours that for sure! True. I have had “mushy” zucchini before. :( I think I’ll slow roast some cherry tomatoes and add it next time. I actually have all that on hand right now, so, guess we’ll be having this for dinner tonight. Thank you. I’m a big believer in the idea that the less you manipulate the ingredients, the better. Sometimes nature gives you something nearly perfect in its natural state and you only need a little oil or garlic or seasoning to pull that flavor out. This is a perfect example of that. It’s kind of amazing how you can really fall in love with a vegetable, but sometimes I’ll be cooking zucchini for example and think, what a miracle it is that zucchini exists. You are speaking to the choir! I feel the same way and yes zucchini really is a miracle. Well put Amanda. Indeed, simply zucchini. Hidden tastes of garlic and basil, topping it with feta is brilliant! It is the simple ingredients that really shine here. I’m so happy to hear from you Fae! I’ve been working too many hours lately to even keep up. Yum! Zucchini’s great! I like the photos too! Hi Seana, your fried zucchini dish reminds me of fried eggplant back home in the Philippines. So good with something salty. Feta cheese is a clever idea, not polarizing like shrimp paste which is what we pair with fried eggplant. Hmmm. shrimp paste with fried eggplant. I’m really trying to grasp the flavor. It must be wonderful. You must be home by now. Hope your trip over here was wonderful. Sure wish I could have been a part of the the convention. I’m sure I missed out, and especially not being able to meet you. I work in education and the convention was the same weekend we had a mad rush at school. Nice to hear from you Dolly. Love this method too, although I’ve never thought to add feta and basil. Great idea! It surely is a common method, although I came from a school of keeping your vegetables a little crisp “al dente” in order to not cook out all the nutrients. Rather or not the nutrients are there I am coming to realize I love the flavor and texture much more when they are cooked until really soft! Basil and feta are a fine combination aren’t they? I’m so glad you posted this as it’s so similar to how I cook mine. Except I don’t even bother to slice them. No, great big chunks. And what is it about the oil that’s left in the pan? Not that it’s left in mine for very long. It’s always mopped up somehow! Too delicious to waste. I know! The oil is never left too long, it’s too damn good to resist. We are usually spooning it out (or scraping rather) before the pan has a chance to cool off. Great big chunks eh? Like the idea…great visual. love it. i make a roasted italian club that has roasted eggplant, zucchini, and chicken (among other things), but i always find it tends to fall apart with all the long piece of veggies i put on there. maybe i’ll give this a try as a substitute. i’ll let you know how it goes. you may have just augmented an already pretty dang tasty recipe. I’m very intrigued about an italian club with roasted vegetables and chicken! Especially eggplant and zucchini. Sounds incredible with some really good bread….please do, let me know if you do it! here’s the recipe i have, but like i said, it is a work in progress. do you think your zucchini would work better? i’m pretty confident it would be awesome. Well, I do like the idea of the longer slices for a sandwich. Not sure, you’ll have to give it a go and let me know! :) The flavors of this zucchini may be different than your oven roasted, so, I imagine either way it is delicious. Nice sandwich for sure! So yummy, especially for zucchini lovers (like I am). I’ve been cooking much with it last months. I like to add some fresh or dried thyme in it. Sometimes you have to love a vegetable dish with the life cooked out of it! You are so right – comfort food! My mother (being English) routinely cooked the life out of everything and sometimes I miss that when I get semi-cooked broccoli or carrots – that have no taste whatsoever. I love this post! Zucchini has always been my favorite vegetable. It was the first green I remember eating as a child. I recall my mom cooking them forever! She boiled them with butter and I loved them. And yes…broccoli needs to have the daylights cooked out of it too! :) Hope you are enjoying your holiday weekend. It is gorgeous here too. Seems as though we always share the same weather! Sometimes the simplest recipes hit the spot perfectly. Thank you for reminding how good those flavors work together. I love zucchini and often cook it very similarly to your wonderful method. Love how you described i as “having the life cooked out of it yet it is full of life” – so true. I love to dice it and sauté it with halved grape tomatoes to add to my scrambled eggs. Okay, now I’m hungry! You are currently reading simply zucchini at COTTAGE GROVE HOUSE.